← Is Robert Downey Jr. in TAIWAN, or his stunt double? Apple is finding that breaking up with Samsung is hard to do. For evidence, look no further than Apple Inc.’s effort to find a company other than ferocious rival Samsung Electronics Co. to make the sophisticated chip brains used in Apple’s iPads and iPhones. This month, after years of technical delays, Apple finally signed a deal with Taiwan Semiconductor Manufacturing Co. to make some of the chips starting in 2014, according to a TSMC executive. The process had been beset by glitches preventing the chips from meeting Apple’s speed and power standards, TSMC officials said. Apple is one of Samsung’s biggest customers for processors and memory chips. But the two firms compete directly in the mobile-phone market and have spent the better part of the past two years suing and countersuing over the look, feel and features of their gadgets. Both companies declined to comment. They were ideal partners a decade ago, when the two didn’t really compete. Then Samsung started rolling out smartphones that today eclipse the iPhone in units shipped. In the past year, Apple executives have expressed concern that their dependence on Samsung limits Apple’s ability to control its destiny by constricting Apple’s negotiating power and ability to use different technologies, according to people who have been told so by Apple executives. Apple, Cupertino, Calif.,has cut back on some purchases. It no longer buys iPhone screens from Samsung and has reduced iPad-screen purchases, suppliers say. And Apple has been buying more flash-memory chips—an essential component for storing data—from other makers, say former Apple executives and officials at another chip supplier. But Apple remains critically dependent on Samsung. 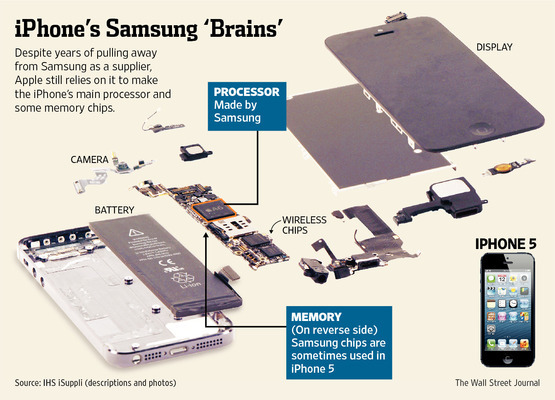 The microprocessor brains that control iPods, iPhones and iPads are Samsung-built. And some new iPads still use Samsung screens, according to examinations of the devices by industry analysts. Apple’s conundrum: Samsung is the world’s biggest maker of some of the most sophisticated parts that Apple craves, such as processors, memory and high-resolution screens. Apple also has more than a half-decade invested in working with Samsung to build custom chips. Replicating that elsewhere is daunting, former Apple executives say. Apple’s deal this month to start buying chips from TSMC is a milestone. Apple long wanted to build its own processors, and it bought a chip company in 2008 to begin designing the chips itself. But it continued to rely on Samsung to make them. As early as 2010, Apple and TSMC started discussing working together to build the chips, say the TSMC executives. In 2011, TSMC senior executive Chiang Shang-yi met Apple officials to discuss collaborating on the complex process. Regarding the relationship with Samsung, Apple isn’t the first to watch a happy tech matchup turn into a marriageó of inconvenience when competition flares. In the 1980s, early in the PC revolution, chip maker Intel Corp. agreed to share technology with Advanced Micro Devices Inc. Later, AMD became a major rival, and Intel spent years trying to undo the agreement. Samsung has reason to keep the Apple relationship alive. Apple is still Samsung’s biggest customer for components, and a complete retreat by Apple from Samsung would hurt Samsung’s earnings, analysts say. Apple’s component orders from Samsung were set to hit around $10 billion last year, says Mark Newman, an analyst at Sanford Bernstein in Hong Kong. That represents a significant chunk of the 67.89 trillion won ($59.13 billion) Samsung posted in sales from its component business, which includes chips and displays. The Apple processor, where Samsung is currently the sole supplier, accounted for $5 billion of purchases in 2012, he estimates. “If Samsung loses Apple as a client, it will have an impact because Apple represents a large portion” of Samsung’s sales of non-memory chips, he says. Apple’s serious relationship with Samsung goes back to early iPod music players in the 2000s. For the first few years, iPods used tiny hard drives to store tunes. 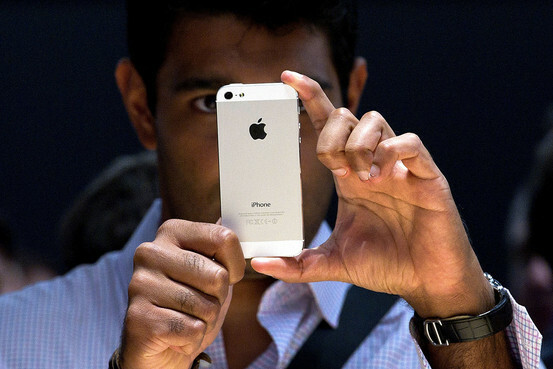 But Apple wanted to use flash-memory chips, which are more reliable and use less power. The problem: flash memory was pricier, and prices can swing wildly. As iPod demand soared, Apple executives signed a deal with Samsung to lock in supply, according to people familiar with the strategy. Apple’s first iPod Shuffle with flash memory hit shelves in 2005. Around that time, Apple executives were looking for a new processor for the iPod. Apple grew concerned that its existing partner, PortalPlayer Inc., wasn’t listening to some of its terms, the former executives say. A spokesman for Nvidia Corp., which bought PortalPlayer, declined to comment. Samsung won some of the business. When Apple’s iPhone hit the market in 2007, its brains were Samsung-made, too. Apple executives weren’t blind to Samsung’s ambitions to compete with it, the former executives say. Samsung told Apple it structured its business to keep the two sides of its business apart and promised to keep its executives from swapping information, the former officials and others familiar with the matter say. Some Apple executives didn’t like enriching Samsung in one side of its business while the other side was attacking Apple. And sharing information with Samsung about Apple business forecasts was harder to stomach, the former executives say. In 2008, Apple set out to shift more of its flash-memory purchases away from Samsung, say the former executives and other people familiar with the strategy. The company announced in 2009 a $500 million prepayment to Toshiba Corp. for future supply of flash memory. At the time, Apple relied heavily on Samsung for a type of flash memory called NAND, because it was one of few big companies that could deliver large quantities of the latest technologies. The move paid off. More than five years ago, Samsung supplied the majority of Apple’s NAND flash memory and a large portion of another chip type, the “DRAM” in mobile devices. Now, each of those portions has fallen to below 10%, Mr. Newman estimates. Apple also broke up with Samsung on screens. Screen quality had become an increasingly important way that Apple tried to differentiate its gadgets. When Apple launched the iPhone 4 in 2010, it dubbed the screen a “retina display” to draw attention to its high resolution. Apple executives felt screens were particularly important to take out of Samsung’s hands, people familiar with Apple’s strategy say. A screen is a phone’s “face,” says DisplaySearch analyst Hiroshi Hayase. “If you buy screens from your competitor, you will be sharing some key information on your next product,” he says. Apple stopped using Samsung smartphone screens in the iPhone 4, which was released in 2010. Apple helped other screen suppliers Sharp Corp. and Toshiba Corp. expand their factories, according to people with knowledge of the situation. A representative for Japan Display Inc., formed from the mobile-display businesses of Toshiba, Sony Corp. and Hitachi Ltd., declined to comment. But other efforts to ditch Samsung have faltered. In 2011, when Apple was designing its third-generation iPad, the company asked Sharp, which was already supplying iPhone screens, to produce the new iPad’s high-resolution displays, says a person close to the supplier. But when Apple launched the third-generation iPad in March 2012, it came mainly with Samsung displays. Sharp had missed the launch deadline as it struggled to mass-produce displays using a new technology, says another person close to the supplier. In March, Samsung agreed to buy a 3% stake in Sharp and to buy more LCD panels from it. The deal would make Samsung not only Sharp’s fifth-largest shareholder but its key client, potentially preventing Apple from gaining more bargaining power with Sharp. — Yun-Hee Kim contributed to this article. A version of this article appeared June 29, 2013, on page A1 in the U.S. edition of The Wall Street Journal, with the headline: Apple Finds It Difficult To Divorce Samsung. This entry was posted in Wireless and tagged Apple, 蘋果, iPhone, Korea, Samsung, smartphone, USA, Wall Street Journal, WSJ, 三星. Bookmark the permalink.